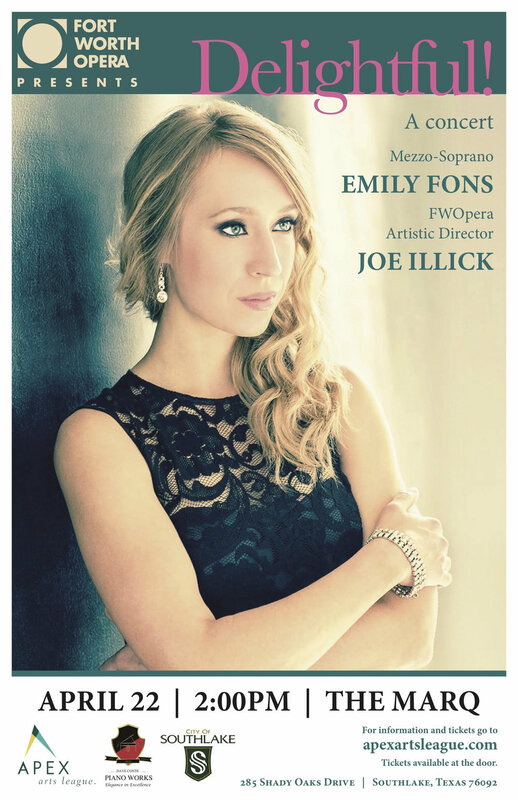 Join Fort Worth Opera (FWOpera), the Apex Arts League, and the City of Southlake for an afternoon of opera arias, Broadway favorites, and celebrated classics from the Great American Songbook, featuring internationally renowned mezzo-soprano Emily Fons. Acclaimed by Opera News as one of opera’s rising stars and praised for her Grammy-nominated role in Jennifer Higdon’s world premiere opera, Cold Mountain, the Wisconsin native will be accompanied by FWOpera Artistic Director Joe Illick at the piano. Tickets a $20 for adults, $15 for seniors and Apex members, and $10 for students, and can be purchased at www.apexartsleague.com or please call 682-651-5026. Southlake-based Apex Arts League sponsors a variety of performing and visual arts programs in the local area. For more information, visit www.apexartsleague.com.